There is no excuse to be lethargic in Buenos Aires. Some of the strongest and best coffee this side of the Atlantic resides in the many thousands of cafes that dot this sophisticated, world-class city. As a visitor, one of the best ways to explore the different neighborhoods and capture the pulse of this captivating metropolis is to visit one of its many cafés “notables.” Noted for their historical and architectural importance, 60 of the city’s bars and cafes are recognized officially as part of the state’s cultural patrimony. 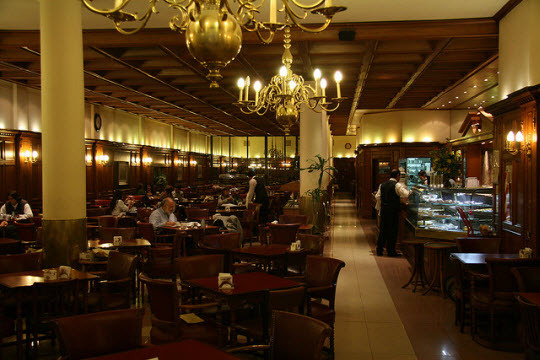 Perhaps the most well-known – and most heavily-touristed – café in Buenos Aires is Café Tortoni (Avenida de Mayo 825, Monserrat). You can’t ignore the history here. 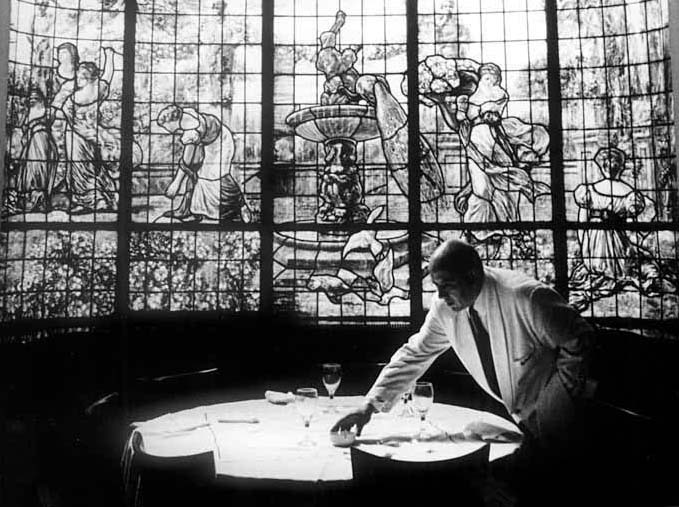 Several tables are posthumously occupied by sculptures of Argentine artists and intelligentsia that used to frequent the café, including tango’s most famous singer, Carlos Gardel, and the poetess Alfonsina Storni. 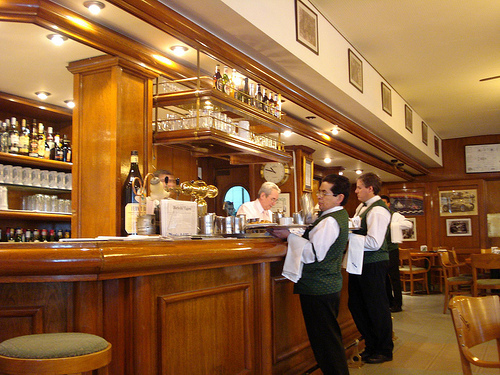 Café Tortoni’s service is gruff, but always impeccable. You won’t mind that your waiter is not trying to chat you up after ordering the piping-hot churros and chocolate. Waiters expertly serve rich hot chocolate from still richer-looking copper kettles and matching cups. You will need the accompanying milk to relax the thick, lava-like chocolate. After dipping a warm, sugar-coated churro in your hot chocolate, you will feel the guilt that comes with such decadence, but not enough to deter you from dipping again and again. If you need a jolt after the soporific chocolate indulgence, order a cortado, or espresso, to get your mettle back. Then, take a peak behind the velvet curtains to take in one of the café’s tango shows or head to the back to shoot some pool. Undoubtedly, after such an elegant experience and a look around at the walls of Café Tortoni, you will leave with a better history of the city and understanding of its people. 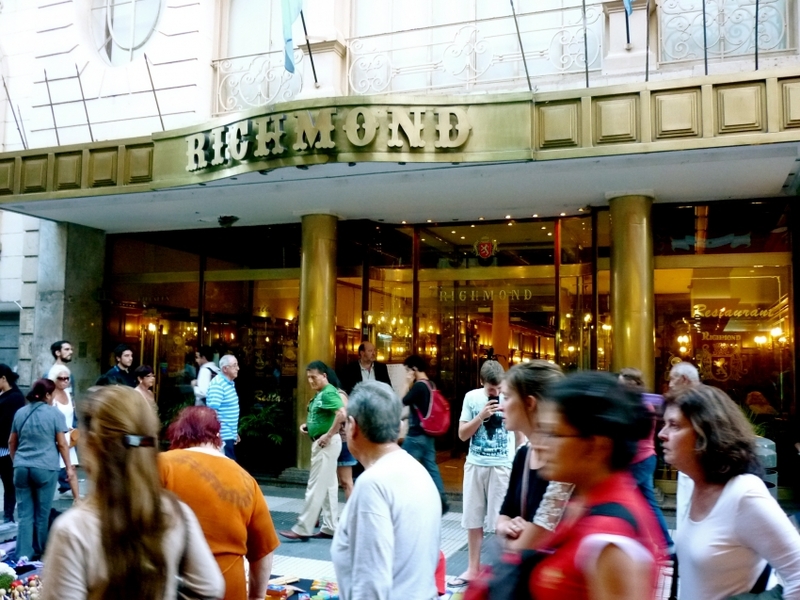 A trip to Buenos Aires would not be complete without a trip to the ever-busy pedestrian street Calle Florida. Amidst the frenetic outside activity of haggling money-changers and shopkeepers trying to hawk leather gaucho-wear sits the calm and sophisticated Café Richmond (Florida 468, San Nicolas). If these walls could talk, they would tell you little more than the coterie of dapper-looking, older men playing chess in the front room could. Retired they may be, but each day these men appear, clad in their Mad Men-style suits, ready for strong coffee and animated conversation over a game of chess. This is reminder enough that some things always are and always will be. The décor is classic 1920’s with old chandeliers casting a warm glow over the long, meandering room. There are places still where a heavy haze of smoke just seems right. Café Richmond is one of them. Although smoking was banned in indoor bars and cafés a few years ago here in Buenos Aires, there are a few loopholes to get around the law. For this and to appease many of its clientele that have been frequenting the café for years, there is a smoking solarium toward the back. The bathrooms of the café are equally impressive in their décor and are worth a gander (seriously) when you patronize the place. Hang out at The Richmond long enough and you might begin to channel the writing voices of two of its leading habitués – Graham Greene and Jorge Luis Borges. Such rich café experiences often demand rich zip codes. Therefore, there is La Biela (Avenida Quintana 600, Recoleta), one of the city’s finest and most regal coffee establishments. 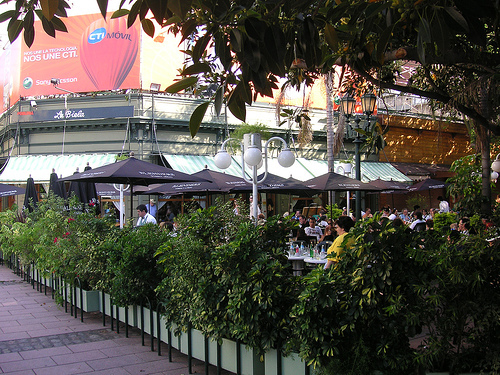 Located on the plaza in front of the famous cemetery where the likes of Evita Peron and other high-brow Portenos go to rest, La Biela caters to the sophisticated elite of Buenos Aires’s wealthiest barrio, Recoleta. 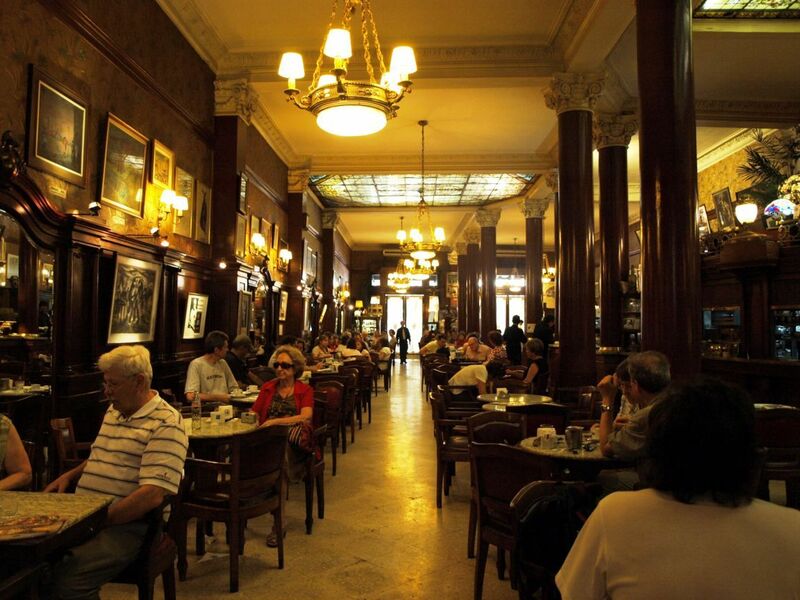 The café dates back all the way to 1850 when Recoleta was more farmland than Belle Epoque, but received its present name in 1950 when Formula One champions and auto racers used it as a gathering place. Patrons of La Biela have the fortune of enjoying their café con leche alfresco. Outside, one can enjoy a favorite Porteno pastime, people-watching. Indulge your curiosities and pass judgment on (or pretend to be totally indifferent to) the many tourists taking in impromptu tango shows, snapping photos of Recoleta Cemetery or admiring the bright white Nuestra Senora de Pilar Catholic church. In cooler months, this is a great place to warm yourself in the afternoon sun; during summer, cool off in the shade if you can snag a table underneath the great limbs of the famed ombu trees with their Wizard of Oz-like appearance. 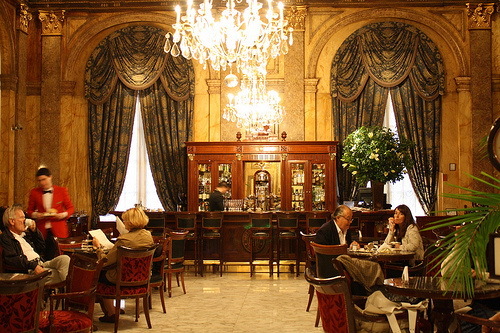 Inside, experience the opulence and splendor one would expect from a café situated just a block away from the Alvear Palace Hotel, the city’s oldest and finest. The room is simple, yet elegant in its fillings. Notably, visitors will see photographs of the connecting rods used in racing cars that the café is named after, along with the famous drivers that put them to the test. Service here is superb and you will be made to feel every bit as sophisticated as the company you are in. Finally, leave the well-trodden tourist path and head to the Almagro neighborhood to visit one of Buenos Aires’s oldest cafés. The recently remodeled Las Violetas (Avenida Rivadavia 3899, Almagro) opened its doors again in 2007 for the first time in over 10 years after a lengthy restoration. Before being declared a cultural heritage site in 1998, the café had been partially abandoned. But now, Las Violetas has brought life back to the city’s Almagro neighborhood. Enter through the gold-plated revolving door on Avenida Rivadavia and you will think you’ve entered a café built by Willy Wonka – the 1920’s version. The first thing you’ll notice are the magnificent glass cases filled with every type of sweet pastry your heart could desire: giant alfajores – mini shortbread cakes filled with dulce de leche and coated with sugar – and their baby offspring, fruit cakes, medialunas, cherry danishes, chocolate pastries, cakes and éclairs. Like many other cafes of its time that sadly no longer exist, Las Violetas is enormous, having enough space to seat 200 guests at one time. Ceilings flaunting gold chandeliers rise 30 feet above finely-crafted Italian marble floors. The café was made more European during the 1920′s by the addition of French stained glass windows, giving it a bright, airy and open feeling. Female or not, one must head upstairs where the ladies’ restroom is located to take a gander at the café in all of its glory. In a nod to Arthur Guinness, Las Violetas serves its coffee black as oil and thick as mud with a white, frothy, bubbling top. If tea is more your cup, then look no further than the Maria Cala tea service – an over-the-top spread of scones, finger sandwiches, cakes and pastries, meant for three, but large enough for six! The city’s thriving café culture should come as no surprise. It was, in no small part, instituted by the city’s coffee-adoring Spanish and Italian immigrants many years ago. While Buenos Aires is not impregnable to Starbucks – they have opened 5 locations since 2006 – the pervasive feeling among the local Portenos is that expediency is not nearly as precious as good company and strong coffee. Whether it’s to discuss the latest futbol standings, wildly escalating ice cream prices or simply gossip, Buenos Aires’s denizens will continue to get together to “tomar un café”, and with that, continue one of the world’s finest café cultures. Now – those are some luxurious cafes!!! Nice post! I love a good cafe, and these ones seem great! @Andi Absolutely agree. Some places are too unique and too special not to be enjoyed by lots of people, tourists and locals alike. Tortoni is definitely one of those places. I don’t care how touristy Tortoni is, I LOVE it. The churros there are out of this world!!! @Caroline – We’ve been following along your and Josh’s journey, very jealously. Amazing to think you’re just at the very beginning of the best and most experiential year of your lives. Keep the updates coming and travel safely. Due to our love of all types of coffee, we will be taking notes and visiting cafes around BA We just tried Kopi in Singapore and love it!